1. Bites are Big – Snacks are back as consumers continue to seek out snacking opportunities at restaurants. This has led to an increase in small plates, light bites, and midday menu additions at chains of all sizes. The buzzword appears to be “bites” with the launch of McDonald’s Chicken McBites and Fish McBites, along with Pretzelmaker’s Pretzel Bites, Whataburger’s Whatachick’n Bites and Dunkin Donuts’ sausage pancake bites. 2. 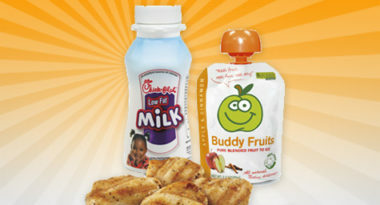 Kids’ Meals Made Healthier – Little ones are in for big changes as the outcry for healthier kids’ meals has finally been met with additions such as milk and apple slices. Some chains have reduced the calories and fat in their meals, while others have started programs promoting healthier childhood lifestyles. “Our new kid’s meal reflects our commitment to helping parents strike a balance between nutrition, convenience and price,” said Woody Faulk, vice president of brand strategy and design at Chick-fil-A. 3. Spicy is Nice – Heat is hot in the quick-service restaurant industry as ingredients like chipotle peppers and jalapeños continue to show up on menu boards. Burger King, McDonald’s, Sonic, and others have added jalapeños to their sandwiches and sauces, while Charley’s Grilled Subs has added both jalapeños and chipotles to its new chicken sandwich. Guacamole is also growing, as seen in Subway’s current seasonal promotional celebrating the spicy spread and Wendy’s introduction of its guac-topped chicken sandwich inspired by customer demand. 4. The Beverage Boom – Both hot and cold drinks have become focal points for quick-service restaurants such as McDonald’s, Krispy Kreme, and Dunkin’ Donuts. The coffee market is still on the rise and chains of all sizes are introducing innovative takes on the classic beverage to grab a piece of that market share. Frozen drinks have also been successful due to warmer winter weather and their popularity is predicted to spike during the summer season. 5. Oreos are Back Around – As the classic crème-filled sandwich cookie celebrates its centennial, numerous chains have developed promotions featuring the nostalgic treat. From the limited-time, cookie-packed parfaits offered at Wendy’s and White Castle, to Dairy Queen’s social-media contest spotlighting its Oreo Blizzards, it appears that restaurants are sweet on this traditional treat. 6. Fruit is Fresh – Many chains have added fruit to their beverages, breakfasts, salads, and sweets for summertime. Peaches are the pick at Popeye’s in their iced tea and pie offerings, while berries are big with Wendy’s seasonal salad and Frosty creations, and strawberries star in two new Krispy Kreme doughnuts. In addition, some other trends gaining momentum include Greek yogurt as a healthy addition to frozen desserts and sweet potato fries as a fun fried alternative. Taco Bell has seen record sales of its new Doritos Locos Taco and is expected to launch other chip-filled versions. With such strong innovation within a few short months, the rest of 2012 looks especially promising as the quick-service restaurant continues its quest to make a comeback with customers. To discover the latest trends in restaurant marketing, contact MDG Advertising today at 561-338-7797 or visit mdgadvertising.com. MDG Advertising, a full-service Florida advertising agency with offices in Boca Raton and New York, NY, specializes in developing targeted Internet marketing solutions, exceptional creative executions and solid branding and media buying strategies that give restaurants a competitive advantage. Contact us today and learn more about how MDG Advertising can develop an integrated marketing strategy to increase lead generation and sales.